Notes: Collects 1-4 of the monthly series. Available in print and digital. For more info, visit alternacomics.com or ask your friendly neighborhood comic store for the print version. I enjoy a fresh take on the zombie apocalypse genre. Our flesh-eating virus bringing carriers of undead fifth brings I feel can never be explored enough in modern horror literature. 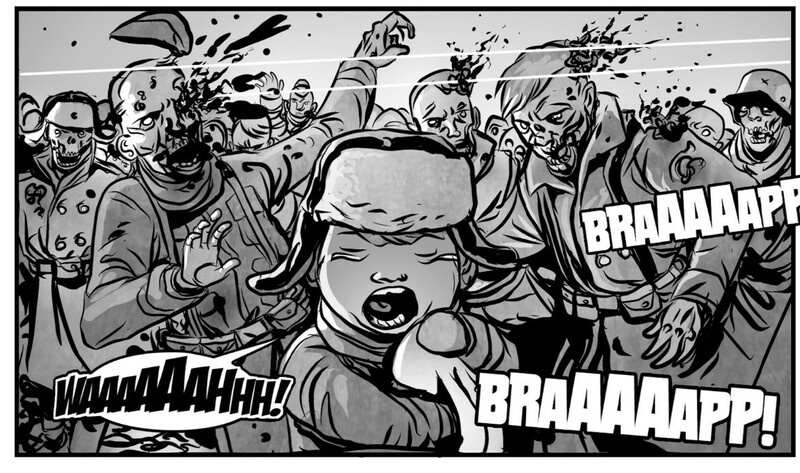 Also, zombies are intriguing when used as a metaphor for the various ills of our modern world. I see a degrading of humanity within zombies, till there is nothing but walking shells with strange animalistic urges. They hunger for a basic need to feed upon the living, to drag down all hopes for civilization in doing so. If not stopped, they eventually become absolute. Zombies I feel are, a violent interpretation of the worse of us from within. As a child, I felt similar about the Nazi advance throughout Europe and the surrounding areas during the early years of World War II. The Axis spread, seemingly unstoppable in their lust to conquer and bring death, destruction along the way. Their ways were like an infection, bringing mass casualties in war especially to the Soviets, said anywhere from 7 to 43 million. For better use in horror and science fiction entertainment, Nazi’s are often picked as the perfect vessels for the undead. The terror of what they brought to the Soviet Union during World War II bought my interest to Jeff McComsey’s Mother Russia. Yet in this short series, we have the zombie plague taking over, but still an army joined together from the casualties of both sides. We have a heroic stand against them by a single female sniper isolated in a tower, Svetlana Gorshkov. She has little idea of how extent the virus spread, though she understands humanity is losing to the inhumanity. She cares little for hope that all will be well, just that she survives long enough to find out. Along the way, she finds a few companions (a child, a dog, a soldier) who carry on that will to survive; as she looks to protect them as well. What follows is the best of humanity, standing against the hordes of the undead. I feel though this is science fiction, I can imagine to those who lived in the war-torn areas of the time (and similar places now), to see no end to the madness. To stand alone and be a sort of beacon of light to anyone not quite given up, is what I gathered in this series. We learn a lot about our heroine as well, as she once lived a simple life. Later, she befriends and finds common ground with a former enemy, as they both look to survive and palso protect a lost child. Within and throughout, are interesting sub-plots within stories. The focus is on what’s left, and worthwhile from the perspective of a child, the protective actions of a loyal pet, the kindness of good strangers, and the will to survive in a bleak setting. However, not too much talk as there is a demand for action throughout. The sequences of danger and zombie blood-letting are immense and plentiful. To mix such humanity of the characters throughout in such a gritty and terrible world is a mix that we see often in modern fiction, though not always done well. Mother Russia delivers in both, on a highly enjoyable level. 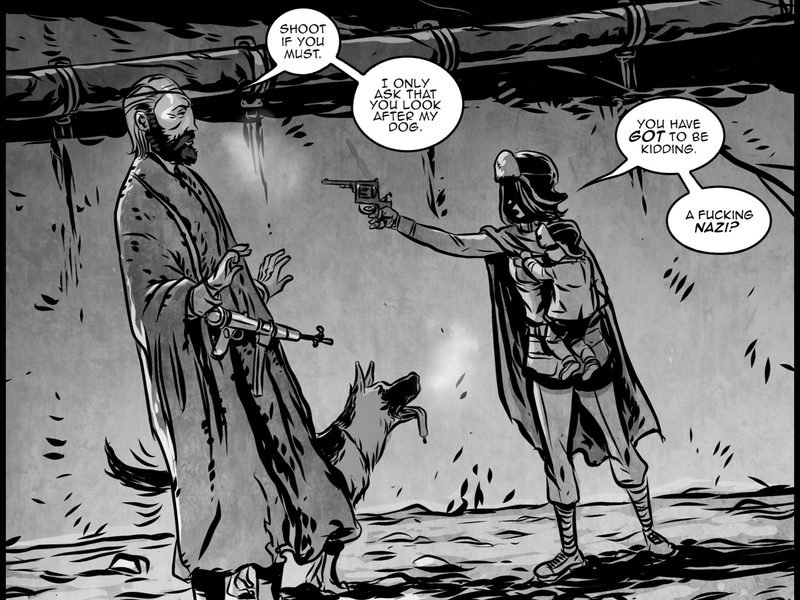 The art is great, and delivered to perfection in its black and white form. The mood of its time feels like something out a black and white cartoon or movie of its time. The greys and dull tones give the feeling of gloom and ever-present threat. Our expressionist faces in the survivors bring a sense of joy, life to the dreariness. 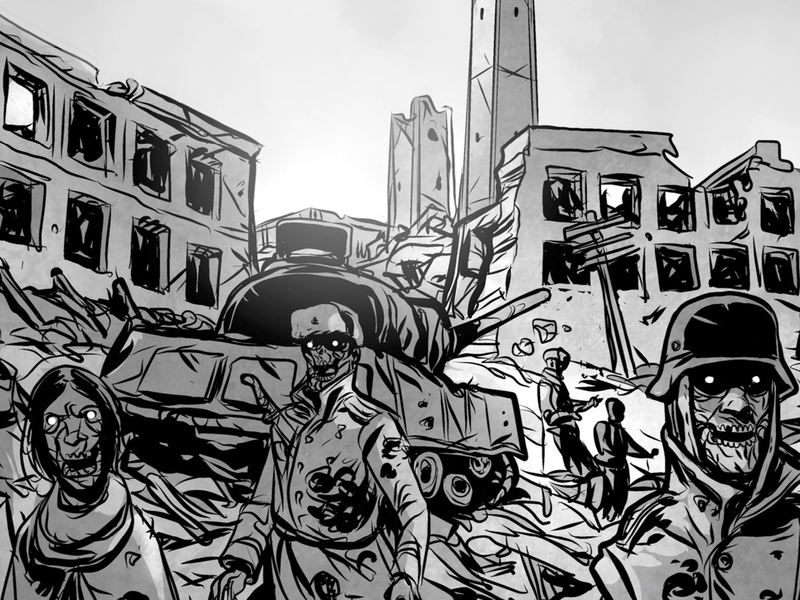 There is exquisite detail in the surroundings of the war-torn areas, especially with the weapons and machines used. The zombies are not as much detailed, almost as messy and disjointed in every way, a perfect presentation to the disorder they bring. 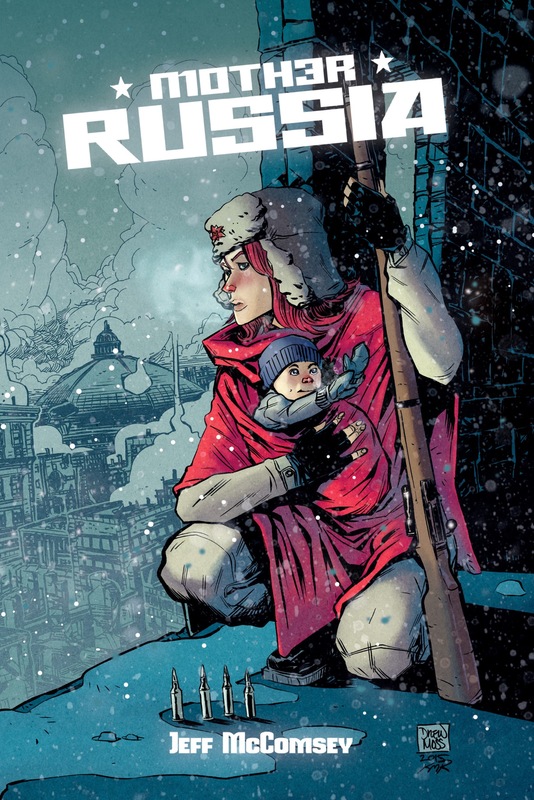 Overall, Mother Russia is a worthwhile read for those who look for something more in their zombie horror, and for those who love good war stories as well. Pick us this up digital or in print, for it is also cheap but worth all the pennies needed and more.